The Allett Westminster is made for creating amazing lawns as well as playing fields. 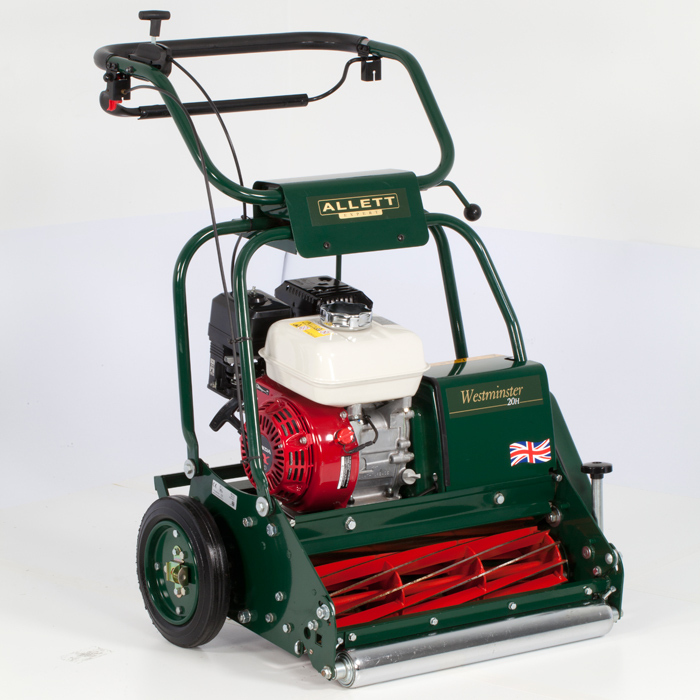 Allett Westminster petrol cylinder lawn mowers are made with a very long service time in mind. The Westminster is a home-grown lawn mower in our range of top quality machines. The superb, close cut precision of the Westminster Petrol Lawn Mower is suitable for the maintenance of cricket wickets, bowling and golf greens and the finest formal ornamental lawns. Powered by a 196cc Honda four stroke cylinder petrol engine, this fine turf mower is equipped with 12 bladed cutting cylinder for extremely close and exact cutting, and an ability to deliver an impressive 145 cuts per metre and a cutting width of 51cm (20”) to ensure good coverage, while at the same time creating crisply defined stripes down your lawn. The mower also features comfortable height adjustable handlebars to help avoid any back strain issues for the operator. Overall Width 79cm / 31"